The discovery and exploration of compounds possessing anti-mutagenic and anti-carcinogenic properties are of great importance. This study investigated the anti-mutagenic and anti-genotoxic effect of ethanolic neem extract on dietary-aflatoxin induced genotoxicity. The assays used were: micronucleus (MN) and sperm morphology assays. Nine groups of mice labeled A-I were exposed to dietary-aflatoxin for three weeks after which they were treated with ethanolic neem extract. One week of 0.5 mL intraperitoneal injection of 25, 50 and 100 mg kg-1 b.wt. neem extract were administered in one, two and three doses daily for groups A-C, D-F and G-I, respectively. Three weeks aflatoxin feed mice and mice with no aflatoxin/neem extract exposure were used as controls 1 and 2, respectively. The three weeks dietary-aflatoxin induced a statistically significant (p<0.05) MN and sperm morphology compared to control 2. The three concentrations utilized reduced the genotoxic effects of dietary-aflatoxin on MN and abnormal sperm morphology assay in a concentration-dependent manner. Higher concentrations of 50 and 100 mg kg-1 b.wt. completely reversed the induced genotoxicity. Neem extract is identified with possible anti-mutagenic and anti-genotoxic potential in this study and should be further studied as a natural source of antimutagenic agent for humans. A large proportion of the populations of developing countries use traditional medicines as a primary health care resource, largely due to the high cost of Western pharmaceuticals and health care and because the traditional medicines are generally more acceptable from a cultural and spiritual perspective (Addae-Mensah, 1992). These results in the co-existence of modern and traditional health care, usually with limited co-operation between the systems. It is estimated that more than 80% of the world's population utilize plants as their primary source of medicinal agents (Cordell, 1995). The use of medicinal plants in therapeutics or as dietary supplements goes back beyond recorded history, but has increased substantially in the last decades (Woods, 1999; WHO, 2002). The popularity of herbal medicines is connected with their easy access, therapeutic efficacy, relatively low cost and assumed absence of toxic side effects. Widespread public opinion is that being a natural product, herbal medicines are harmless and free from adverse effects and it is believed that even if the expected medical effect is not achieved, their consumption is not dangerous (Castro et al., 2009). The discovery and exploration of compounds possessing anti-mutagenic and anti-carcinogenic properties are of great importance. Many indigenous substances possess some inhibitory activity towards natural and man-made environmental genotoxic agents (Grover and Bala, 1992; Brockman et al., 1992). Nowadays, medicinal plants have received growing attention as a chemo-preventive agent. There are many reports showing the rising trends of anti-mutagenicity studies with extracts of plants. Various Indian medicinal plant extracts were tested for their anti-mutagenic activities by employing Ames Salmonella test (Arora et al., 2003). Recently, a wide range of South African medicinal plant extracts were investigated for mutagenic and anti-mutagenic effects in Salmonella microsome and micronucleus test (Verschaeve et al., 2004). The aqueous extracts of fermented and unfermented tea (Aspalathus linearis) and honeybush tea (Cyclopia intermedia), were found to possess anti-mutagenic activity against 2-acetylaminofluorene and aflatoxin B1 (Marnewick et al., 2000). Lemon grass (Cymbopogon citratus Stapf) extract was also found to have anti-mutagenic effect towards various known mutagens in Salmonella typhimurium strains TA98 and TA100 (Vinitketkumnuen et al., 1994). The Neem (Azadirachta indica A. Juss), is an indigenous plant commonly grown in India and its sub-continent. It is one of the most versatile multipurpose plant species well known for its insecticidal and various types of biomedical properties (Naqvi et al., 1994; Govindachari, 1992; ICAR, 1993). Almost every part of neem tree have been known to possess a wide range of pharmacological properties (Khan et al., 2000; Biswas et al., 2002; Moslem and El-Kholie, 2009; Owai and Gloria, 2010) and hence, traditionally used to treat large number of diseases including malignancies (Van Der Nat et al., 1991). Water soluble part of alcoholic extract of A. indica leaves was found to possess significant hypoglycemic, hypolipidemic, hepatoprotective, antifertility and hypotensive activities. It was also shown to exert significant anti-inflammatory and antiulcer effects in rats (Chattopadhyay et al., 1998; Garg et al., 1993). Experiment in different animal models appears to suggest that different extracts of various parts of A. indica may have varied effects on fertility in male and female animals (Aladakatti and Ahmed, 1999; Aladakatti et al., 2001; Joshi et al., 1996; Choudhary et al., 1990; Deshpande et al., 1980; Prakash et al., 1988). In the present study, the anti-mutagenic and anti-genotoxic property of ethanolic extract of neem against dietary-aflatoxin induced genotoxicity is studied using animal bioassays: bone marrow micronucleus and mice sperm morphology assays in mice. Neem extraction: The neem (Azadirachta indica A. Juss; identified by Anokwuru C.P., Babcock University) bark was collected in June 2009, washed and air dried for one month. The barks were chopped into tiny pieces before they were milled into powder using a warring blender. The powdered plant was soxhlet extracted with 80% ethanol (v/v) and the crude extract was obtained by concentrating the solvent soluble extract using the rotary evaporator at 45°C. The sample was then allowed to dry. Mice chow: Two categories of mice chow were used in this study: test (contaminated) and control (uncontaminated) chow. The test chow was formulated using the exact weight definitions given by Fapohunda et al. (2009). The source of aflatoxin in the test chow was from contaminated stored maize kernels and groundnut cake (GNC) purchased from a Feed mill situated at Ijebu-Ode, Nigeria. The ingredients were properly mixed, ground and pelleted into 5 mM in diameter cylinders of the complete ration. Total aflatoxin level of the test feed formula at the time of administration to the mice was 78 parts per billion (ppb) as determined by the AgraQuant total aflatoxin assay (ELISA) 4/40 kit. The uncontaminated chow was of same composition and aflatoxin-free (total aflatoxin value was <LOD = 4 ppb). Biological materials: Young male Swiss-albino mice of 6-10 weeks old were obtained from Nigeria Institute of Medical Research, Lagos, Nigeria. They were acclimatized in a pathogen-free, well ventilated room at the Department of Biosciences and Biotechnology, Babcock University, Ogun State, Nigeria for 2 weeks. They were supplied with uninterrupted water and food and maintained in the same room throughout the period of study. Mice 8 weeks old were used for MN assay while mice of 12-14 weeks were used for sperm morphology assay. Mice were cared for according to standard guidelines (CIOMS, 1985). Micronucleus assay: Three concentrations (25, 50 and 100 mg kg-1 b.wt.) and nine groups (4 mice per group) were used in this assay. All the groups were exposed to the aflatoxin contaminated feed for three weeks (3 weeks was chosen because genotoxicity at three weeks have been previously confirmed by Fapohunda et al. (2008), after which normal feed was restored in their diet for one week while intraperitoneal (IP) injections of 0.5 mL of the extract (25, 50 and 100 mg kg-1 b.wt.) were administered daily for seven days as follows: groups A-C, D-F and G-I received one dose, two doses and three doses of 0.5 mL daily IP injection of 25, 50 and 100 mg kg-1 b.wt., respectively for seven days. Two controls: 3 weeks aflatoxin fed mice group and mice without aflatoxin or neem extract exposure designated controls 1 and 2, respectively were also set up. IP injection was utilized because this can be carefully controlled and also because the test mixtures can be rapidly absorbed from the peritoneum into the blood stream. MN was carried out as previously described by Alabi and Shokunbi (2011) and Bakare et al. (2009). Briefly, the femurs were surgically removed after the animals had been sacrificed by cervical dislocation. The bone marrow was flushed from the femurs with Foetal Bovine serum (Sigma Aldrich Cheme GmbH, Germany). The cells were centrifuged for 5 min at 2000 rpm and the slides were subsequently stained with May-Grunwald and Giemsa stains, respectively. Both immature and mature erythrocytes in bone marrow were analyzed. For each mouse 1000 cells were accessed randomly for Polychromatic Erythrocytes (PCE), Normochromatic Erythrocytes (NCE), Micronucleated Polychromatic Erythrocytes (MNPCE) and Micronucleated Normochromatic Erythrocytes (MNNCE). Sperm morphology assay: For this assay, same number of mice, number, concentration and types of samples, controls and exposure duration as the MN assay were utilized. The methods of Alabi and Bakare (2011) and Wyrobek et al. (1983) were utilized. The animals were sacrificed 35 days from the first day of aflatoxin exposure. This is because spermatogenesis takes about 34.5 days to complete in mice. Sperms were sampled from the caudal epididymis after the animals had been sacrificed by cervical dislocation. Two sperm suspensions were prepared from the caudal of each testis by mincing the caudal in physiological saline. The prepared slides were stained with 1% Eosine Y for 45 min after which the slides were air dried. 800 sperm cells/mouse were assessed for morphological abnormalities under oil immersion at 1000x according to the criteria of Wyrobek and Bruce (1975). Statistical analysis: The SPSS® 14.0 statistical package was used for data analysis. Significance at the different dose-level of each assay was tested by using the Dunett t-test and Student t-test. ANOVA was used for testing significance with a probability of 0.05. Anti-mutagenicity and anti-genotoxicity of neem extract in micronucleus assay: The aflatoxin exposed animals (control 1) induced an increase in the micronucleated PCE and reduction in the PCE of the mice bone marrow which is statistically significant (p<0.05) as compared to the value of control 2 (animals without aflatoxin exposure). Figure 1a and b show the MN induced in the bone marrow of exposed mice. The post-treatment of dietary-aflatoxin induced genotoxicity using the three concentrations of ethanolic neem extract yielded varied results. Table 1 shows the frequency of MN induced alone by aflatoxin-contaminated feed and the effect of post-treatment with 25, 50 and 100 mg kg-1 b.wt. neem extract. The result of 25 mg kg-1 b.wt. extract showed a decrease in genotoxicity at the injection volume utilized. Although it produced numerical increase in PCE with subsequent decrease in NCE, however, the decrease in MNPCE in two of the treated groups were not statistically significant (p<0.05) compared to control 1. In accordance with the result obtained, only 3 doses showed a statistically significant decrease in MNPCE compared to control 1. In 50 and 100 mg kg-1 b.wt. extract however, a clear negative effect on induction of MN by neem extract was found in all exposure. There was decrease in the percentage MNPCE in all exposure which is statistically significant (p<0.05) compared with the aflatoxin-exposed animals alone. The 50 mg kg-1 b.wt. result yielded a complete reversal of the genotoxic effect of aflatoxin-contaminated feed. However, the statistical analysis showed that this result is not dose dependent as one, two and three doses results were not statistically different. Antimutagenicity of neem extract in sperm morphology assay: Figure 2a-h show the different types of abnormal sperm cells observed in mice exposed to aflatoxin-contaminated feed. The aflatoxin-contaminated feed induced a statistical significant (p<0.05) abnormal sperm cells compared with control 2. Folded sperm cells have the highest occurrence (23.8%) while double tail sperm cells have the lowest occurrence (0.1%). Table 2 shows the frequency of occurrence of abnormal sperm cells observed by the aflatoxin-contaminated feed alone and the effect of post- treatment with 25, 50 and 100 mg kg-1 b.wt. neem extract. A comparative amount of reduction of sperm morphology was observed in neem treated mice at the three concentrations used. The reduction in the dietary-aflatoxin induced sperm morphology was concentration dependent as 100 mg kg-1 b.wt. reduced most followed by 50 mg kg-1 b.wt. and then 25 mg kg-1 b.wt. Generally, the results showed that aflatoxin-contaminated feed is very mutagenic and genotoxic using MN and sperm morphology assays. Neem extract effectively reduced the frequency of MN and abnormal sperm cells when administered as post-treatment at 25, 50 and 100 mg kg¯ 1 b.wt. for 1 week. The reduction of MN and sperm aberrations observed was not dose dependent, but concentration dependent in the sperm morphology assay. The occurrence of cytogenetic damage in the dietary-aflatoxin exposed mice has been demonstrated by an increased frequency of MN in the bone marrow and abnormal sperm cells. These results are more environmentally relevant because dietary-aflatoxin exposure is more realistic of what occurs in nature. Aflatoxins are still recognized as the most important mycotoxins. They have been isolated from all major cereal crops and from sources as diverse as peanut butter and marijuana. The staple commodities regularly contaminated with aflatoxins include cassava, chillies, corn, cotton seed, millet, peanuts, rice, sorghum, sunflower seeds, tree nuts, wheat and a variety of spices intended for human or animal food use. The genotoxicity of aflatoxin has been confirmed in many reports (Gong et al., 2002; Guindon et al., 2007; Abd El-Aziem et al., 2007; Fapohunda et al., 2008). The results of the present investigation clearly showed that the neem extract had an anti-mutagenic and anti-genotoxic potential in the mice. The neem leaves extract suppressed the action of dietary-aflatoxin as measured in MN and sperm abnormality tests. The post-treatment showed protective activity in the assays used. The post-treatment anti-mutagenic effect in the MN and SHAT could be due to increase in DNA repair. This mechanism of action could be called bio-antimutagenicity (Morita et al., 1978; Kada, 1983) or fidelogenesis. A similar result has been reported in a simultaneous, pre-treatment and post-treatment of Chinese harmster V79 cells by A. blazei extract (Menoli et al., 2001). The exact mechanism by which neem extract reduces or minimizes the genotoxicity of dietary aflatoxin is not understood. However, the protective effect of neem extract could be ascribed to the antioxidant property, as it is known that neem contains a number of potent antioxidants and anticarcinogens including carotenes, terpenoids, limonoids, quercetin and sitosterol (Govindachari, 1992; Schaaf et al., 2000; Farah et al., 2006) that might be inhibiting the genotoxic effect of dietary aflatoxin in this investigation. There are also reports in literature to suggest that neem products have significant modulating effect on the humoral and cell-mediated immune system and hence acts as a non-specific immunostimulant and selectively activates the cell-mediated immune mechanisms to elicit an enhanced response to subsequent mitogenic and antigenic challenge by increasing the level of leucocytic cells, enhanced phagocytic activity of peritoneal macrophages and expression of Major histocompatibility complex (MHC) class II antigens, as well as induced production of gamma interferon (Upadhyay et al., 1992). This is also probably responsible for the anti-mutagenic effect of neem extract observed in this study. The result of this present study is in accordance with previous reports. Subapriya et al. (2005) has shown the protective effect of ethanolic extract of neem leaf on 7,12-dimethylbenz[a]anthracene (DMBA)-induced genotoxicity and oxidative stress in mice. Neem extract has also been shown to be protective against N-methyl-N'-nitro-N-nitrosoguanidine (MNNG)-induced genotoxicity and oxidative stress in mice (Subapriya et al., 2004), MNNG-induced oxidative stress in rats (Subapriya et al., 2003), murine carcinogenesis model systems (Dasgupta et al., 2004) and cytogenetic damages in freshwater fish, Channa punctatus (Farah et al., 2006). However, contrary to report by Dasgupta et al. (2004), where low doses of neem extract was found to be inhibiting cancer incidence than higher doses, our result showed that doses are not significant but higher concentration of the extract reversed the aflatoxin-induced genotoxicity in the treated mice. In conclusion, neem extract has been shown to be a potential antigenotoxic and antimutagenic agent in this study. It has the ability of complete reversal of aflatoxin-induced genotoxicity in mice as shown by our results. The obtained data indicated that natural products such as neem extracts may yield a wealth of commercially viable antimutagenic agents. The precise characterization of the antimutagenic activity of neem extracts and to exactly identify the active compounds and their modes of action is recommended. Further studies on different vertebrate models are needed to determine whether administration of neem extract is a practical approach to antimutagenesis in humans. The authors want to thank the authorities of Babcock University for the provision of the facilities used for this study. Abd El-Aziem, H.S., A.Z. Saleh and A.F. Farrag, 2007. Impact of whey proteins on the genotoxic effects of aflatoxins in rats. Int. J. Dairy. Sci., 2: 126-137. Addae-Mensah, I., 1992. Towards a Rational Scientific Basis for Herbal Medicine: A Phytochemist's Two-decade Contribution. Ghana University Press, Accra, pp: 62. Alabi, O.A. and O. Shokunbi, 2011. Toxicological effects of hospital wastewater using animal bioassays. Annals Biol. Res., 2: 265-275. Aladakatti, R.H. and R.N. Ahmed, 1999. 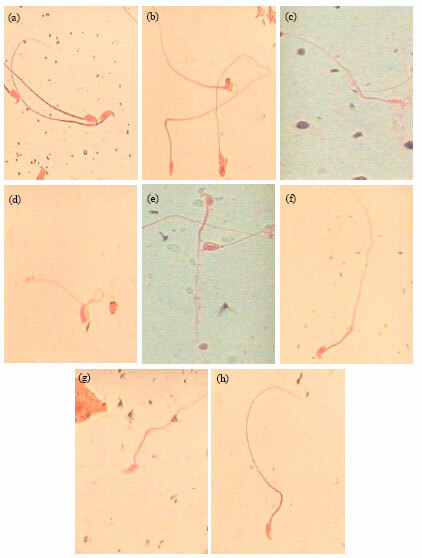 Effect of Azadirachta indica leaves on rat spermatozoa. Indian J. Exp. Biol., 37: 1251-1254. Aladakatti, R.H., R. Nazeer Ahamed, M. Ahmed and M.G. Ghosesawar, 2001. Sperm parameters changes induced by Azadirachta indica in albino rats. J. Basic Clin. Physiol. Pharmacol., 12: 69-76. Arora, S., K. Kaur and S. Kaur, 2003. Indian medicinal plants as a reservoir of protective phytochemicals. Teratogenesis Carcinogenesis Mutagenesis, 1: 295-300. Bakare, A.A., A.A. Okunola, O.A. Adetunji and H.B. Jenmi, 2009. Genotoxicity assessment of a pharmaceutical effluent using four bioassays. Genet. Mol. Biol., 32: 373-381. Brockman, H.E, H.F. Stack and M.D. Waters, 1992. Antimutagenicity profiles of some natural substances. Mutat. Res., 267: 157-172. CIOMS, 1985. International guiding principles for biomedical research involving animals, WHO, Geneva, Switzerland. Castro, L.S., F.F. Perazzo and E.L. Maistro, 2009. Genotoxicity testing of Ambelania occidentalis (Apocynaceae) leaf extract in vivo. Genet. Mol. Res., 8: 440-447. Chattopadhyay, R.N., S.K. Maitra and R.R. Chattopadhyay, 1998. Possible mechanism of antihyperglycemic effect of Azadirachta indica leaf extract: Part I. Fitoterapia, 64: 332-335. Choudhary, D.N., J.N. Singh, S.K. Verma and B.P. Singh, 1990. Anti-fertility effects of leaf extracts of some plants in male rats. Indian J. Exp. Biol., 28: 714-716. Cordell, G.A., 1995. Changing strategies in natural products chemistry. Phytochemistry, 40: 1585-1612. Deshpande, V.Y., K.N. Mendulkar and N.L. Sadre, 1980. Male anti-fertility activity of Azadirachta Indica in mice. J. Postgrad. Med., 26: 167-170. Fapohunda, S.O., C.N. Ezekiel, O.A. Alabi, A. Omole and S.O. Chioma, 2008. Aflatoxin-mediated sperm and blood cell abnormalities in mice fed with contaminated corn. Mycobiology, 36: 255-259. Fapohunda, S.O., T. Akintewe, A. Olarinmoye and C.N. Ezekiel, 2009. Anti-aflatoxigenic potentials of Two Nigerian Herbs on albino rats. J. Biol. Environ. Sci., 3: 81-90. Garg, G.P., S.K. Nigam and C.W. Ogle, 1993. The gastric antiulcer effects of the leaves of the neem tree. Planta Med., 59: 215-217. Gong, Y.Y., K. Cardwell, A. Hounsa, S. Egal, P.C. Turner, A.J. Hall and C.P. Wild, 2002. Dietary Aflatoxin exposure and impaired growth in young children from Benin and Togo: Cross sectional study. Br. Med. J., 325: 20-21. Govindachari, T.R., 1992. Chemical and biologicl investigations on Azadirachta indica (The neem tree). Curr. Sci., 63: 117-122. Grover, S.I. and S. Bala, 1992. Antimutagenic activity of Terminalia chebula (myroblan) in Salmonella typhimurium. Indian J. Exp. Biol., 30: 339-341. Guindon, K.A., L.L. Bedard and T.E. Massey, 2007. Elevation of 8-hydroxydeoxyguanosine in DNA from isolated mouse lung cells following In vivo treatment with aflatoxin B1. Toxicol. Sci., 98: 57-62. ICAR., 1993. World Neem Conference Souvenir. ICAR, Bangalore, India. Joshi, A.R., R.N. Ahamed, K.M. Pathan and B. Manivannah, 1996. Effect of Azadirachta indica leaves on testis and its recovery in albino rats. Indian J. Exp. Biol., 34: 1091-1094. Kada, T., 1983. Environmental and biological factors suppressing induction of mutagens. Toxicol. Forum Annu. Meet., 6: 580-589. Khan, M.F., M.A. Khan and R. Tabassum, 2000. Lethal effects of neem fruit extract against mosquitoes as compared to Killifish. Pak. J. Biol. Sci., 3: 1037-1038. Marnewick, J.L., W.C. Gelderblom and E. Joubert, 2000. An investigation on the antimutagenic properties of South Africa herbal teas. Mutat. Res., 471: 157-166. Menoli, R.C., M.S. Mantovani, L.R. Riberio, G. Speit and B.Q. Jordao, 2001. Antimutagenic effect of the mushroom Agaricus blazei Murril extract on V79 cells. Mutat. Res., 496: 5-13. Morita, K., M. Hara and T. Kada, 1978. Studies on natural desmutagens: Screening for vegetable and fruit factors active in inactivation of mutagenic pyrolysis products from amino acids. Agric. Biol. Chem. J., 42: 1235-1238. Moslem, M.A. and E.M. El-Kholie, 2009. Effect of neem (Azardirachta indica A. Juss) seeds and leaves extract on some plant pathogenic fungi. Pak. J. Biol. Sci., 12: 1045-1048. Naqvi, S.N.H., K.H. Temuri, S.M. Nurulain and M.F. Khan, 1994. Toxicity and IGR effects of neem fractions in Aedes aegypti (PCSIR strain). Pak. J. Ent., Karachi, 9: 83-90. Owai, P.U. and M. Gloria, 2010. Effects of components of Melia azadirachta on coccidia infections in broilers in calabar, Nigeria. Int. J. Poultry Sci., 9: 931-934. Prakash, A.O., R.K. Tewari and R. Mathur, 1988. Non-hormonal post-coital contraceptive action of neem oil in rats. J. Ethnopharmacol., 23: 53-59. Schaaf, O., A.P. Jarvis, S.A. van der Esch, G. Giagnacovo and N.J. Oldham, 2000. Rapid and sensitive analysis of azadirachtin and related terpenoids from neem (Azadirachta indica) by high-performance liquid chromatography-atmospheric pressure chemical ionization mass spectrometry. J. Chromatogr. A., 886: 89-97. Subapriya, R., R. Kumaraguruparan, K.V. Chandramohan and S. Nagini, 2003. Chemoprotective effects of ethanolic extract of neem leaf against MNNG-induced oxidative stress. Pharmazie., 58: 512-517. Subapriya, R., R. Kumaraguruparan, S.K. Abraham and S. Nagini, 2004. Protective effects of ethanolic neem leaf extract on N-methyl-N'-nitro-N-nitrosoguanidine-induced genotoxicity and oxidative stress in mice. Drug Chem. Toxicol., 27: 15-26. Subapriya, R., R. Kumaraguruparan, S.K. Abraham and S. Nagini, 2005. Protective effects of ethanolic neem leaf extract on DMBA-induced genotoxicity and oxidative stress in mice. J. Herb. Pharmacother., 5: 39-50. Upadhyay, S.N., S. Dhawan, S. Garg and G.P. Talwar, 1992. Immunomodulatory effects of neem (Azadirachta indicaM) oil. Int. J. Immunopharmacol., 14: 1187-1193. Van der Nat, M.G., K.T.D. van der Sluis and R.P. Labadie, 1991. Ethnophormocognostical survey of Azadirachta indica Juss (Maliaceae). J. Ethnopharmacol. 35: 1-24. Verschaeve, L., V. Kestens, J.L.S. Taylor, E.E. Elgorashia and A. Maes et al., 2004. Investigation of the antimutagenic effects of selected South African medicinal plant extracts. Toxicol. In vitro, 18: 29-35. Vinitketkumnuen, U., R. Puatanachokchai, P. Kongtawelert, N. Lertprasertsuke and T. Matsushima, 1994. Antimutagenicity of lemon grass Cymbopogon citratrus Stapf to various known mutagens in Salmonella mutation assay. Mutat. Res., 341: 71-75.
WHO, 2002. Drug Information Herbal Medicines. World Health Organization, Geneva. Woods, P.W., 1999. Herbal healing. Essence, 30: 42-46. Wyrobek, A.J. and W.R. Bruce, 1975. Chemical induction of sperm abnormalities in mice. Proc. Natl. Acad. Sci. USA., 72: 4425-4429. Wyrobek, A.J., L.A. Gordon, J.G. Burkhart, M.W. Francis and R.W. Kapp Jr. et al., 1983. An evaluation of the mouse sperm morphology test and other sperm tests in non-human mammals. A report of the US Environmental Protection Agency Gene-Tox Program. Mutat. Res., 115: 1-72.